combining guzheng (a Chinese string instrument), koto (a Japanese string instrument), flute, acoustic guitar, monochord, percussion, piano, and shakuhachi (a Japanese flute). recorded by Margot Reisinger at the Minho Sound Studio. The monk choir of the Kopan Monastery can be heard on tracks 3,4,5 and 7. 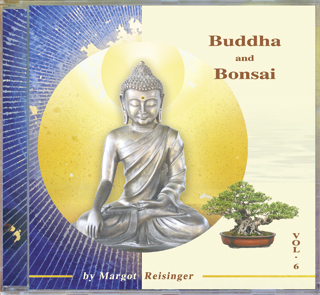 Designed to relax the mind, and enable the listener to drift into a calm, light-filled sphere of transparent sound, Buddha and Bonsai Vol.6 evokes the complete peace of a Zen garden, the purity of a high mountain retreat. This meditative offering creates a perfect background for any kind of energy work or healing treatment. Sound engineer Tom Bates, winner of 9 Grammy awards, cares for the best sound quality. The monk choir of the Kopan Monastery was recorded by Tom Bates on location in Nepal.